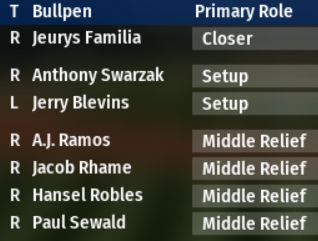 On the pitching side of things, we’re probably also going to move almost all of these guys. Syndergaar and Matz both fall into the same situation as Conforto. They are free agents after 2021, and while I’d love to keep them, if there is a great deal, I’ll definitely take it. Also, if they are willing to sign an extension at a good price, I’d definitely want to keep them. Yamaguchi, our Scouting Director, only really loves Callahan. He’s the only 3-star or higher prospect in our minors. However, the OSA, which also loves Callahan, actually likes a handful of our prospects better than Yamaguchi. It should be interesting to see who is right on these guys. Just a reminder, I am the Baseball Community Manager for Out of the Park Developments, makers of Out of the Park Baseball. This series is not an ad for the game. This is an ad for the game: If you’re interested in checking out Out of the Park Baseball 19, you can go to ThatSportsGamer.com/OOTP19, and use Promo Code TSG19 to save 10%.